Trevor King was born in India, spent his youth in Ghana, before returning to India as a student at St. Joseph’s Boys School. After moving permanently to the US, Trevor met and married his wife Doris. He founded Citland International, an Atlanta, Georgia-based company in 1989. Citland International provides equipment and services to the mining industry. Trevor visited Africa frequently for work and these visits kept Africa, and Ghana in particular, in his heart. Building Solid Foundations in order to renovate and equip the laboratory at the Apam Catholic Hospital. This remarkable gift will fund improvements to the laboratory physical space, installation of new laboratory equipment, and training for hospital personnel. “We are working with Worldwide Lab Improvement, Inc. to fine-tune our selection of laboratory equipment and supplies so that everything is appropriate for the needs of medical personnel working in Apam, Ghana,” said Building Solid Foundations’ Board Member Dr. Rich Kurz. “I can’t imagine a more fitting tribute to Trevor’s memory,” said Doris King during a recent conversation with Building Solid Foundations’ Executive Director Grace Quartey. 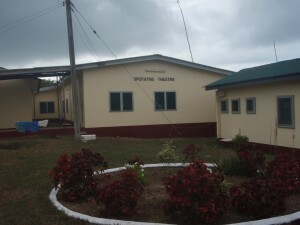 The Apam Catholic Hospital in Apam, Ghana.